How to Eat It: Stir-fry 100% buckwheat (soba) noodles with shrimp and veggies, or cook buckwheat groats (kasha) like rice and add lemon, olive oil, and fresh herbs. If you’ve eat Ethiopian food, you’ve tried endear, a spongy crepe-like bread made from teff. This forgotten grain is loaded with protein at 10 grams per cup, and has a high percentage of vitamin B1. How to Eat it: Add teff flour with other gluten-free flours in pancakes or as a soup thickener. Also try teff grains as a creamy polenta with mushrooms and tomatoes. Eating healthy sometimes looks like rabbit food. Gluten-free eating looks like bird food. And it is! Ever buy birdseed? 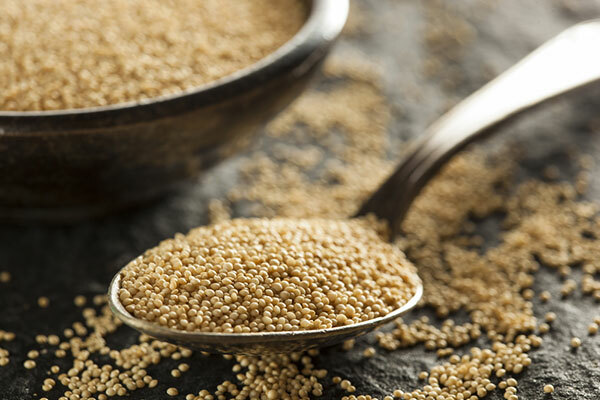 The little light colored pellets are millet, a nutritional powerhouse packed with manganese that is just as important for humans as it is for animals. How to Eat it: Buy pre-made puffs for cereal, use as a stuffing for peppers or chicken, or combine with beans, onions and spices for a veggie burger. Native to Africa, this offbeat option is high in antioxidants and can be turned into a sweet flour alternative, or into a low glycemic syrup. How to Eat It: Replace wheat flour with sorghum flour in baked goods, or combine cooked sorghum with beans and kale for a pilaf. When raw, it starts out a deep black color, and changes to a bright purple once it’s cooked. A 2019 study in the journal Circulation found that middle-aged women with high consumption of forbidden rice (and other anthocyanin-rich foods) were 32% less likely to suffer heart attacks. Also called Coix Seeds or Chinese barley, this chewy grain is teardrop-shaped and often used to treat cancer in China. How to Eat it: Perfect for soups and stews, or added to wild rice and mushrooms then stuffed into butternut squash. Native to the Himalayas and taking only 20 minutes to prepare, cooked red rice is low in calories and high in protein, fiber, phosphorus, manganese, and magnesium. In other words, it’s loaded in good-for-you nutrients. How to Eat it: Steam like regular rice, or toss with nuts and dried fruit for a sweet-savory pilaf. A staple of Southwestern Native Americans, blue corn is a bit sweeter than yellow cornmeal, and also has more protein and fiber. How to Eat it: Sub in wherever you’d use yellow cornmeal: muffins, blue corn polenta, or this Vegan Blue Cornbread!